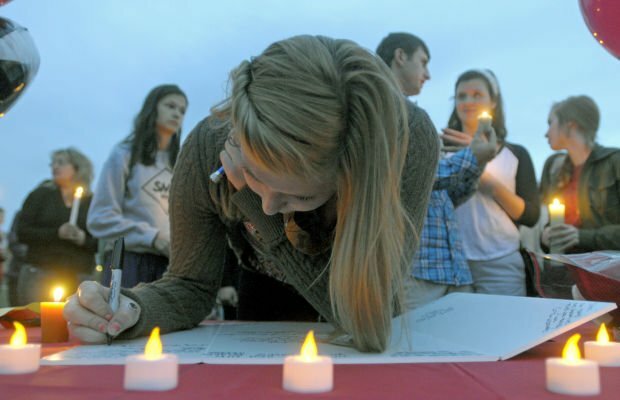 Missoula Big Sky High School student Emma Didier writes a message on a large notebook during the candlelight vigil held for Diren Dede at the Fort Missoula soccer fields Friday evening. Missoula Big Sky High School soccer coach Jay Bostrom speaks to those gathered at Friday's candlelight vigil for Diren Dede. Friends and classmates of Diren Dede gather with lit candles during a vigil held at the Fort Missoula soccer fields Friday evening. Kate Walker and Randy Smith, Diren Dede's host family, are interviewed by local media in front of their home in Missoula's Grant Creek neighborhood on Thursday afternoon. Neighbors and friends assembled a makeshift memorial from flowers, a soccer ball balloon, a German flag and cans of Sprite, Dede's favorite drink. The cans spelled out Dede's initials, "DD." Attorneys for the Missoula man accused of killing German exchange student Diren Dede say the teen's companion on the night of the shooting told police they had entered local garages on several previous occasions. Paul Ryan, who represents Markus Kaarma, said the other teenager was a foreign exchange student from Ecuador who has since returned to his home country. He didn’t release the student’s name. Kaarma, 29, is charged with deliberate homicide for shooting Dede twice in the early hours of April 27, after Dede and his companion entered Kaarma’s Grant Creek garage. The Ecuadorian exchange student fled the scene after shots were fired, but later agreed to be interviewed by police. Ryan said the friend told police that he and Dede started “garage hopping” after they learned about the practice from other students at Big Sky High School. It’s unknown if Dede and his companion had burglarized Kaarma’s garage prior to the shooting. In a statement released Tuesday, Ryan said Kaarma and his wife, Janelle Pflager, had been burglarized twice prior to the night of the fatal shooting and they felt uneasy, especially with their 10-month-old son in the home. He said the burglars in the prior incidents didn’t enter the residence, but took credit cards and phones from the garage. The couple contacted law enforcement once to report the burglaries, but received little assistance, Ryan wrote. “Markus felt a high level of fear and anxiety for himself and his family due to the burglaries and lack of response from law enforcement,” he said. The couple decided to set up a video camera and a motion sensor in their garage to detect an intruder. At 12:30 a.m., they were alerted to Dede’s presence in their garage. Ryan claims “they watched in fear and terror” as the intruder entered the garage and headed toward the kitchen door. Kaarma, Ryan wrote, believed the intruder posed “an imminent threat” to himself and his family. The 29-year-old former firefighter got up from the couch and grabbed a shotgun before exiting the front door and turning to face the dark garage. He fired four shots into the darkness, while his wife called 9-1-1. After Kaarma hit and mortally wounded Dede, Ryan said Pflager administered “lifesaving procedures” and comforted Dede. Dede was pronounced dead later that morning at St. Patrick Hospital. Prosecutors allege that Kaarma intentionally baited the burglars into the garage by leaving the door open and placing a purse inside. Ryan staunchly refutes that claim. “The family’s garage door was open for ventilation because Markus and Janelle smoke cigarettes in the garage and had done so minutes before this tragedy,” Ryan wrote. The purse, Ryan said, wasn’t in plain view, but was in the back of the garage. Missoula police suspect Kaarma had used marijuana the night of the shooting, but Ryan refused to directly answer questions regarding the allegation. “We are waiting for the blood results to come back from the drug test, and after that we will have further comment on the issue,” Ryan said. Missoula Detective Dean Chrestenson requested a blood sample from Kaarma following the shooting. According to a search warrant released Tuesday, the couple’s neighbors reported Kaarma smoked marijuana in the garage on occasion and burglars had stolen marijuana and marijuana pipes prior to April 27’s fatal shooting. A search of the couple’s home also revealed a mason jar full of marijuana, the search warrant stated. The results of the blood test are expected to be completed within the month. In his statement, Ryan also said that Kaarma and Pflager’s homeowners assocation sent out an email on April 24, informing the neighborhood of several recent burglaries. Kaarma, who is free on bail, is set to be arraigned on May 12 at 4 p.m. in Missoula County District Court. Kaarma plans on entering a not guilty plea. Ryan has assembled a team of Missoula defense attorneys to represent Kaarma, including Brian Smith, Katie Lacny, Nate Holloway and Lisa Kauffman. Reporter Kathryn Haake can be reached at 523-5268 or at kate.haake@missoulian.com. BERLIN — The father of a 17-year-old German exchange student shot dead in Missoula criticized the gun culture in the U.S. Thursday. 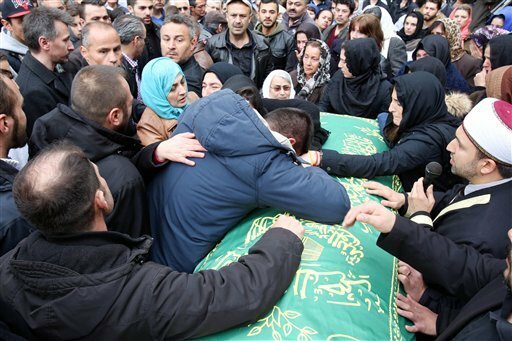 "America cannot continue to play cowboy," Celal Dede told the German news agency dpa after arriving in the U.S. to arrange the transport of his son Diren's body back to Germany. A look back at the most-viewed online stories, photos and galleries for the past week on Missoulian.com. It’ll take another $10,000 for an alleged young burglar of the Grant Creek home of Janelle Pflager and Markus Kaarma to get out of jail.